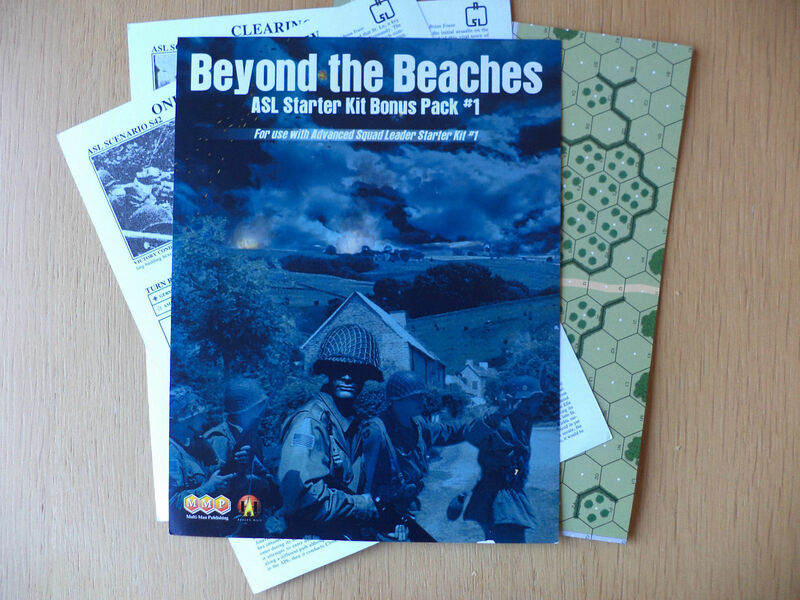 Beyond the Beaches (BP1) is a small supplement for people who play the ASL Starter Kits, adding another map to the system and a few scenarios. It is small in size, but symbolically represents a point of departure that ASL players should perhaps consider seriously (click here to skip the “consider seriously” part and get straight to the product description). When the ASL Starter Kit was first conceived, and published as ASLSK #1, the original idea was to assemble an easy-to-learn subset of the core ASL rules that would help newbies get into the ASL system by easing their way into full ASL. 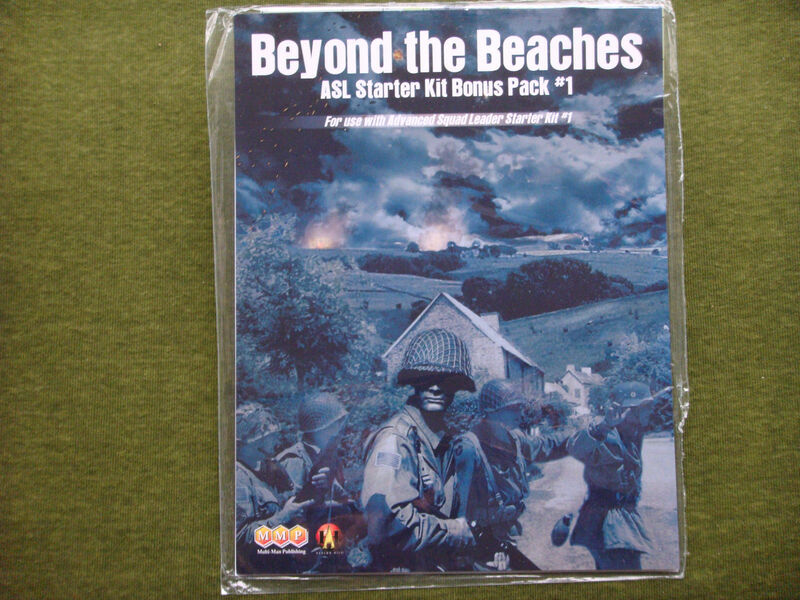 However, as sales of the first two ASL Starter Kits rose, MMP began to reconsider their original idea of having the Starter Kits act as an entrée into ASL and became more open to the notion of the ASLSK as an open-ended series of its own, with further “Starter Kit” products of different types to be released in the future. The decision was controversial, with some ASLers supporting it (or not caring), but others opposed to the de facto creation of a two-tiered system that would provide new products to people unwilling to make the leap from ASLSK to ASL. Some opposed the notion of such a two-tiered system, while others did not like the idea of those resources spent on something other than full ASL. 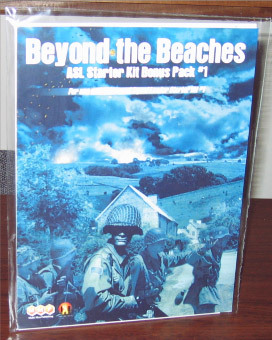 Although MMP began work on a historical ASLSK module and an expansion set (sort of like an Action Pack for ASLSK), the first expansion beyond the three ASLSK core rules sets to actually see publication is BP1, which appears to have been a relatively hasty production designed for release to coincide with a “Military History Weekend” in Virginia for military history buffs, modelers, reenactors, and military miniatures enthusiasts. The release of BP1 is a good opportunity to visit the subject of to what extent ASLers should support the ASLSK series, now that ASLSK is going beyond a set of core basic rules into a true parallel system of its own. Many ASLers supported ASLSK#1, or even Kits #1-3, because of the likelihood that the ASLSK rules would bring new players to the system, players who would “graduate” to full ASL and become future opponents and friends (a phenomenon that has to some degree indeed occurred). Thus many ASLers bought the ASLSK products in order to teach the system to new players, or simply to support MMP in an idea they agreed with. Others bought the products, even though they had no intention of using them, because they were completists, because they thought the maps might be used in full ASL scenarios (as they have, to a limited degree), or because they simply were loyal MMP fans and wanted to support the company that produced ASL. But should those ASLers support these new expansion products? Unlike the core ASLSK modules, these expansions are products, after all, that do not cater to people interested in getting into full ASL, but rather cater to those people who are NOT interested in getting into ASL, but want to stick with ASLSK. Moreover, the more of these expansions published, the greater the chance there will be that more ASLSKers will decide not to bother learning the full ASL rules, though they otherwise might have made the effort. Thus, “strategically” these products have little to offer ASLers. Do they offer anything else of value to ASLers? So far, the answer is not much, primarily because MMP has shown extremely little interest in providing ASL value to any of their ASLSK products. No ASLSK product contains any full ASL scenarios whatsoever, not even conversions of the ASLSK scenarios in those products. 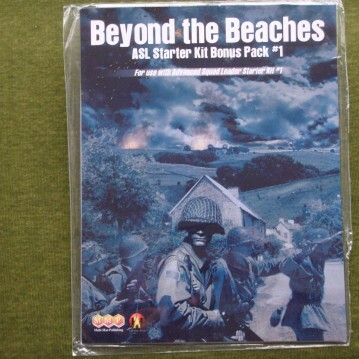 Nor has MMP independently provided ASL conversions of their ASLSK scenarios for purchase or download. Only one ASLSK map has ever appeared in an ASL product (map v, which was included in an issue of the ASL Journal), and only two official ASL scenarios use any ASLSK maps (as of this writing in 2007, one scenario appearing in the ASL Journal and one in Action Pack #3). Nor does MMP currently allow people to buy ASLSK maps individually, so that ASLers can use them with official or unofficial scenarios that utilize such maps; ASLers who seek those maps are instead forced to buy the whole ASLSK product, even though they may have no use for the remaining components. So far, MMP’s rollout of the ASL Starter Kit has not treated loyal ASLers all that well. If ASLSK expansions included considerations for ASLers, it would be another matter, but it does not appear as if this will be the case (obviously it is not the case for BP1). It is a legitimate question as to how much ASLers should support the expansion of the ASL Starter Kit, since so far there’s been little about ASLSK that has supported ASLers. Leaving aside the broader issue of ASL vs. ASLSK, it is time to bore down to the specifics of BP1. BP1 is a relatively minimalist product that sells for $10; for that amount, one gets a geomorphic mapboard, three scenarios, and a page of rules (back-printed on one of the scenario cards and also doing double duty as the product’s back matter). Given its origins, and the fact that all three of the scenarios seem designed for use with ASL Starter Kit #1, it seems likely that both products (ASLSK1 and BP1) were offered for sale at the military buff convention at which BP1 debuted. Ten dollars doesn’t seem like much, but one doesn’t get much for it, either, and more than $3 a scenario is fairly pricey, given the relative lack of other components. Though it has no effect on game play whatsoever, it should be noted that BP1 comes with a very striking cover illustration. The product is merely shrink-wrapped, rather than coming in a baggie or box, so players will have to find some way to store the components on their own. The three scenarios that come with BP1 are all tiny American vs. German scenarios set in Normandy. The most squads any side has in any of the scenarios is seven, so the (all infantry) scenarios will play very quickly. Several of the scenarios feature “lite” versions of complicated ASL rules sections; namely, OBA and HIP. In each case, an SSR paragraph is used to construct a simplified rule designed to capture the major effects of the actual ASL rule. In doing so, some of the effects are considerably different. For example, the OBA SSRs bring down a 16FP column IFT attack on a seven-hex grouping, but unlike normal ASL, TEM is not taken into account, making it potentially much more devastating (especially considering how tiny the scenarios are). Some of these rules, too, do not seem adequately edited. 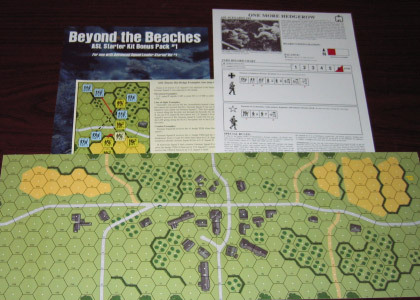 For example, the faux-HIP rule in S43 states that if an American unit enters a hidden German unit’s hex during the Advance Phase, then close combat will ensue and “the hidden unit gets a -2 on the ambush dr if in a building hex.” But the very first sentence of this SSR states that the Germans may only place hidden units in building hexes, so the second reference is at best redundant and might even confuse new players. It seems likely that this error appeared because the designers cut and pasted the HIP SSR from S42 (One More Hedgerow), which allows HIP in three types of terrain (two of which would be ambush terrain), without adequately editing it. Similarly, sentences such as “An attack against a hidden unit is resolved as Area Fire with half FP on the IFT” could be confusing to ASLSK players, who may not understand that this is a reference to firing at an empty hex that might contain a hidden unit. The S42 version of this SSR adds “or for ordnance by adding a +2 DRM.” However, S42 contains no ordnance, not even a simple mortar. Did the OB originally contain an American mortar, perhaps later deleted for compatibility with ASLSK #1? Perhaps so, but the rule as is may leave newbie players wondering what is even meant by the word “ordnance” in this context. It is pretty sloppy. In addition to these SSRs, BP1 also comes with a page of Hedge rules, printed on the back of a scenario card. This should immediately raise alarm bells for ASLSK players. The single most problematic aspect of the original Squad Leader series (Squad Leader, plus its three “sequel” gamettes) was that each new SL product introduced more rules, in a separate rules booklet, some of which replaced or modified rules in earlier products. Players needed to be able to keep track of rules in a variety of different rulebooks and it became extremely difficult to do so. This is one of the major reasons why ASLSK #2 and ASLSK #3 recapitulate the entire ASLSK #1 ruleset, as opposed to simply adding new rules (the other reason is so that people can “start” with one of the later kits). Even so, there are currently three separate “versions” of the ASLSK rules, and now a fourth rules section, which is not even printed as a rules page but included on the back of a piece of cardstock. It seems as if the squadleaderization of ASLSK has now begun. The “Hedge Rules” add simplified rules for ASL hedges, made possible by the fact that the accompanying map is carefully designed so that there are no hedges adjacent to terrain such as woods or buildings. One hopes that these were adequately developed, but given that even the full ASL wall/hedge rules just recently were given a revision for clarification purposes, a quarter century after their initial release, it may be a bit optimistic to assume so. Some of the language used may be rather confusing for beginners, such as the rules for LOS along a hedge hexspine: “A hedge laying lengthwise (on a hexspine) exactly along a LOS is a LOS obstacle only if the hedge hexspine is not touching the viewing or target hex, or if touching one of the viewing/target hexes and the vertex opposite of the viewing/target hex has walls/hedges on all of its three hexspines.” It doesn’t help that the rules sometimes refer to walls, as in the above example, which are non-existent in ASLSK. The Hedge TEM rules state that “the TEM of a hedge is +1 if the target is in the hex formed by that hexside/hexspine,” but they do not add “and the fire crosses a hedge hexside/hexspine,” so reading the rules literally, it could seem that no matter where the fire came from, a unit adjacent to a hedge could claim hedge TEM. Interestingly, the way the hedge “wall” advantage rules are written, a unit in a woods/building hex could simultaneously use the woods/building TEM yet still have wall advantage over the hedge (though the way map p is constructed, there are only two places where a hedge is adjacent to a woods or building hex: V0 and T5, both of which are adjacent to hexspines). The rules also don’t explain what happens when two enemy units face each other across a hedge hexspine. Is there “wall” advantage? Do both sides get the TEM? ASL players, of course, know the answers, but ASLSK players would not. The Hedge Rules are encompassed in just four paragraphs; however, there is also an illustrated example to depict how they work. Some of the example text could have been better worded. For example, explaining LOS, the example text reads: “Generally, you can see the hex immediately behind a hedge hexside, but cannot see beyond that hex.” It probably needed to have the phrase “unless you are adjacent to a hedge hexwide/hexspine,” after the word “generally.” The example text also states that “this also applies when LOS is traced along the hexside, not through the hexside.” Was one of these supposed to be “hexspine?” It is also only from the example, not from the rules, that one learns that a unit without wall advantage can still get the Hedge TEM if fired at by a unit that does not actually possess that wall advantage. Given the nature of map p, which features grain fields with hedge hexsides in which the grain butts up right against the hedge depiction, it probably would have been useful for the rules or the examples to clarify whether fire shot down a hexspine (such as from BB9 to Z9) gets a grain hindrance DRM or not. The last component in BP1 is the map, map p. This map depicts a small crossroads hamlet with stone buildings, as well as some outlaying orchards and fields. Judging by the scenarios, one of which even includes a form of “bocage” rules, it is apparently supposed to stand in for hedgerow terrain in Normandy, which it resembles not at all. It is, however, a serviceable village board. The buildings are not so tiny as in some other ASLSK maps, so LOS is not as wide open as in those maps. The artwork is better, too, than in some earlier ASLSK maps. Unfortunately, the map contains a physical defect, in that it was somehow improperly cut, with a small part of row GG “chopped off,” such that when the board is folded in half, one half-board is slightly shorter than the other half-board. This will not affect any scenario that only uses map p, but will be irritating to players trying to line that map edge up with other map edges. It is reminiscent of some of the poorly cut ASL mounted maps, which were a problem the new style mapboards were supposed to have eliminated. As a product, BP1 seems somewhat sloppy compared to previous ASLSK releases; it does not appear to be one of MMP’s better efforts.